In the directional solidification process, molds are preheated well above the melting temperature of the alloy. Once the mold is fully heated, the alloy is poured into the mold and cooled in a controlled fashion. 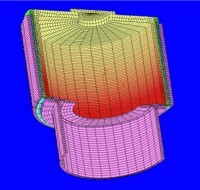 By controlling the cooling process a directional crystallographic structure can be obtained in the solidified casting. Depending upon slight variations to the process, either a single crystal or columnar grain structure can be obtained. These casting are used predominately in the hot zone sections of aerospace or industrial gas turbine engines. In directional solidification / single crystal processing; withdraw rates, melt and mold temperatures, mold susceptor profiles and casting atmosphere are critical to manufacturing quality product. Ajax TOCCO engineers are proficient in DS / SX processing and offer several unique design features that differ from conventional DS / SX vacuum induction casting furnaces. These features provide our customers with a competitive advantage by lowering operational and maintenance costs, as well as by improving process performance.